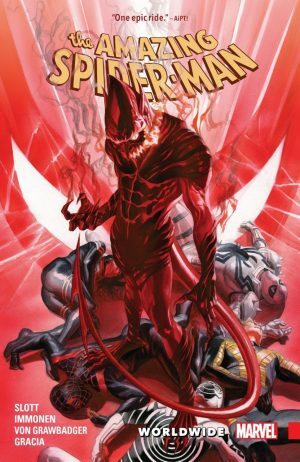 Barring any specials or one-offs he might produce in the future, this is Dan Slott’s final work on Spider-Man, and concludes the Worldwide series, released as Red Goblin in North America and Go Down Swinging in the UK. 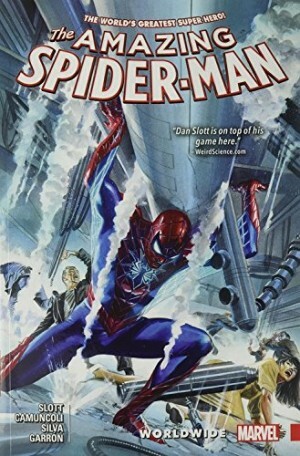 Slott began as one of a team of writers before embarking on an almost nine year run that ranks with the greats, constantly surprising, never standing still and introducing a flood of good ideas. Had he tailed off toward the end, there could be no complaints. He hasn’t tailed off, and the opening nine pages cut back and forth between two characters scenes, each of them with a specific purpose and each of them perfectly scripted to instil the appropriate mood. 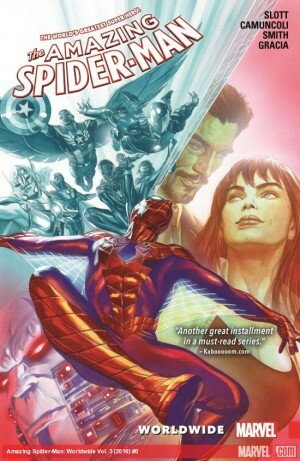 Norman Osborn has abducted someone, and Peter Parker and Mary Jane Watson have a discussion after their meeting in Threat Level Red. Stuart Immonen’s presentation of how these scenes progress is a textbook lesson in how to lay out two longish conversations to keep the interest up. The remainder of that episode is equally good, perfectly pitched, and that’s just the beginning of one hell of a page turner. 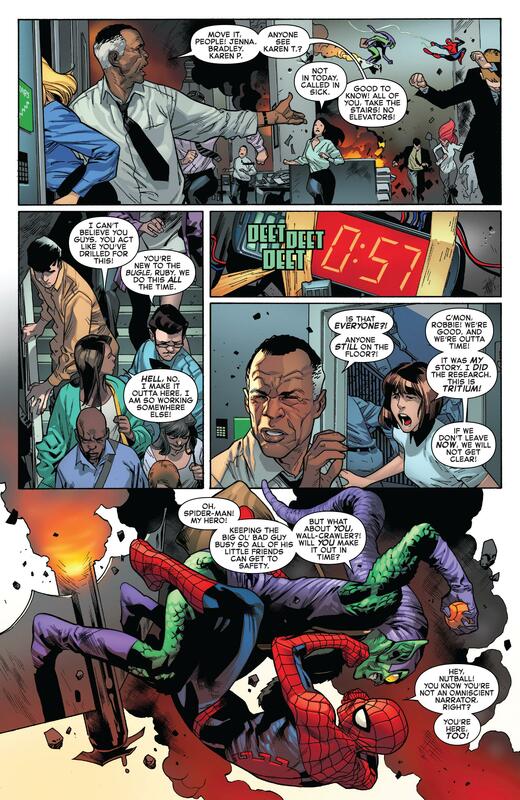 Osborn has always been one of Spider-Man’s most persistent foes, and has finally circumvented a procedure that stopped him becoming the Green Goblin. The method ramps up an already terrifyingly unhinged personality, Slott and Immonen providing a fantastic chapter emphasising how Osborn’s threat has increased and underlining that some tried and trusted methods of ending the threat are now redundant. 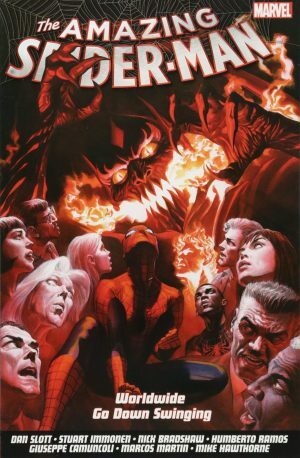 Osborn has been generally well used across the Marvel line since his decades long absence, and Slott cultivates an appropriate sense of desperation for Spider-Man and his allies as they realise what he’s become and what he can do. Immonen’s art is fantastic throughout, seeming understated, but everything is there from exceptional storytelling to detail to the spectacular pin-up image. Giuseppe Camuncoli and Humberto Ramos have both distinguished themselves on Slott’s Spider-Man, but even when they return to contribute it’s still Immonen’s art that shines. Nick Bradshaw’s also good on a short chapter, and there’s also a return for Marcos Martin on the epilogue, deliberately posed and styled to look like the work of Spider-Man’s co-creator Steve Ditko, forming an exceptionally successful homage. 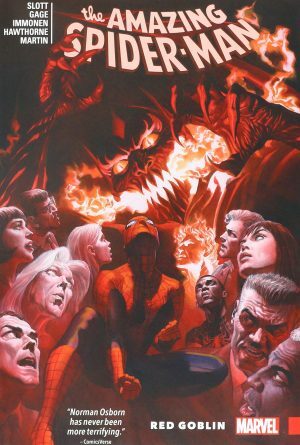 Slott’s plot keeps throwing surprises, reintroducing so many people connected with Spider-Man’s world, and a sense of desperation keeps increasing as the threats keep escalating. The expectation is that Slott will keep heading down that road until what seems like breaking point, and it’s superbly manipulated to reach a well conceived pay-off. 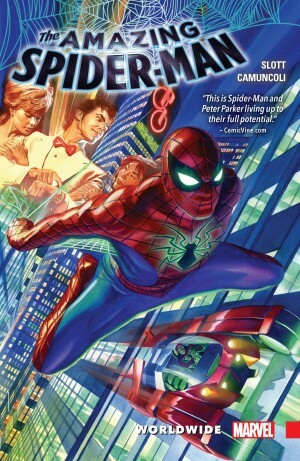 A few epilogue scenes follow, and Slott bids farewell with a sentimental underlining of why Spider-Man is important to the community. 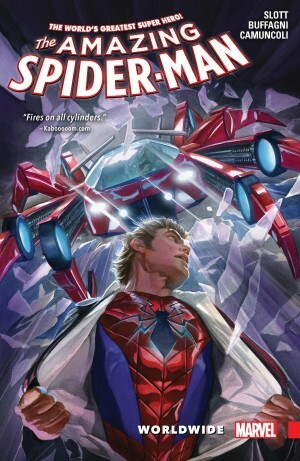 For some people the departure of a long-running supporting character may be unpalatable, but Slott’s able to recontextualise their earliest behaviour in modern day terms, and that works. Excitement, sadness and suspense are constant companions here. Departing creators generally pull out all the stops, but surely Slott has set the bar almost impossibly high for anyone else concluding their run on a superhero series.